Though EA may still be attempting to argue that players in NCAA video games don’t exactly represent the likenesses of the real athletes (they even filed a study that only about 15% of in-game characters match height, weight, home state, and position) ultimately that will be a tough sell to a jury in the monumental lawsuit ahead. Instead what they have been producing being protected as artistic works appeared to be the far stronger point to be made but the hits keep on coming for the NCAA, CLC, and EA who appear to be in big trouble. 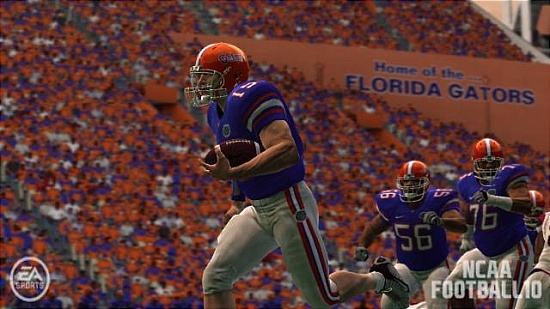 A post on SBNation with the info and image coming from a reader details how Tim Tebow’s name actually appeared in NCAA Football 10. An entire formation was based on Tim Tebow – Shotgun Twin QB Tebow. This completely undermines EA’s declarations that they don’t use names or base players on their real life counterparts. Displaying that a formation and plays were designed with particular athletes in mind could be a smoking gun that the three defendants went too far in profiting off likenesses that may, or may not, be protected under the First Amendment. That argument however recently hit a snag as noted yesterday. Given that much of the basis of their defense regarding video games has been that player names have never been used this could end up being a crucial development if it gets entered into evidence. EA has won a previous case regarding player likeness with the courts ruling video games are artistic works rather than commercial speech and therefore protected by the First Amendment. The Supreme Court in 2011 established forms of media, producing expressive works of art, are not subject to judgments based on incorporating someone’s name or likeness. One dismissed case however, involving Ryan Hart, has resurfaced after an appeals court reversed a decision based on that argument.